Nagas and the feminine Naginis are serpent figures who play a role in the Hindu and Buddhist mythologies. 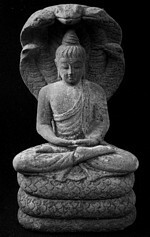 The source of the Nagas may possibly be attributed to the pre-Aryan fertility cults of ancient India. In the Hindu mythology, the nagas reside within the earth in an aquatic underworld. They are embodiments of terrestrial waters as well as door-and gate-custodians. In terms of significance, the nagas are creatures of abundant power who defend the underworld and confer fertility and prosperity upon those with which they are individually associated in the worldy realm—a meadow, a shrine, a temple, or even a whole kingdom. If a naga is suitably worshipped, prosperity can result. If ignored, snubbed, or affronted, the naga can cause debacle and cataclysm. In the Buddhist tradition, when Gautama Buddha attains enlightenment, he is said to have been protected by the hood of hood of Nagaraja Mucilinda, symbolizing the principle that the nagas can place their natural powers in the service of a Buddha. 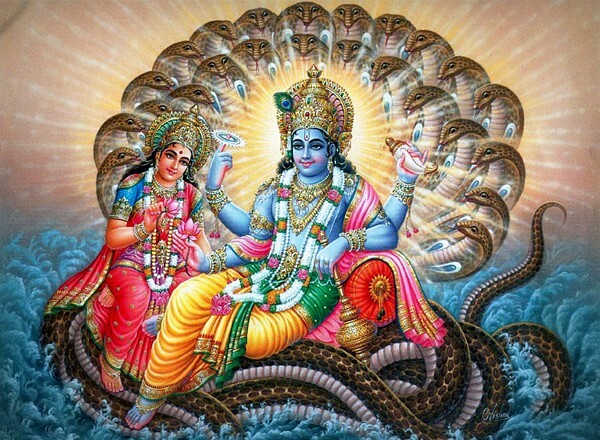 In the Hindu tradition, Vishnu and his avatar Krishna are both portrayed as vanquishers of serpents, indicating their power over the realm of waters. 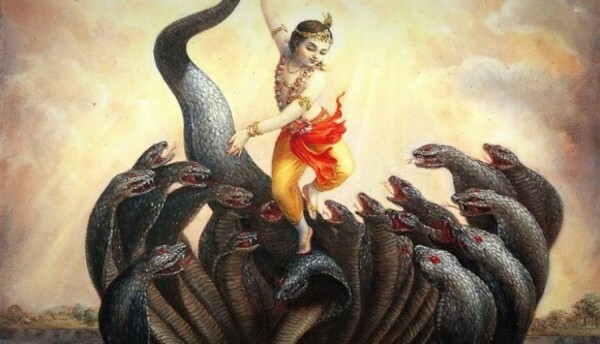 In the middle of the dissolution of one epoch and the beginning of another epoch, Vishnu sleeps on what is left of the old world, a remainder of the cosmic sacrifice represented by the serpent Ananta-Shesha. Krishna conquers the poisonous Naga Kaliya living in the Yamuna river. And Shiva is portrayed adorned with the “Nagendra Haara,” the garland of a serpent. A naga also covers the linga—the iconic representation of Shiva. The Hindu festival Naga Panchami centers around the traditional worship of snakes or serpents throughout India and also in Nepal.